St. Vincent de Paul Lithuanian Catholic Church, Springfield, IL. Undated. Courtesy of Rick Dunham and The Illinois Times. At every stop on their coal mining trail, some Lithuanian immigrants showed their intent to settle by forming a Lithuanian Catholic parish. Here in Springfield, several hundred families and individuals came together in 1906 to form their own. Excavations for the church building began around 1907, with miners digging the basement at night. In 1908, they laid the cornerstone of St. Vincent de Paul Lithuanian Catholic Church at 8th St. and Enos Ave. 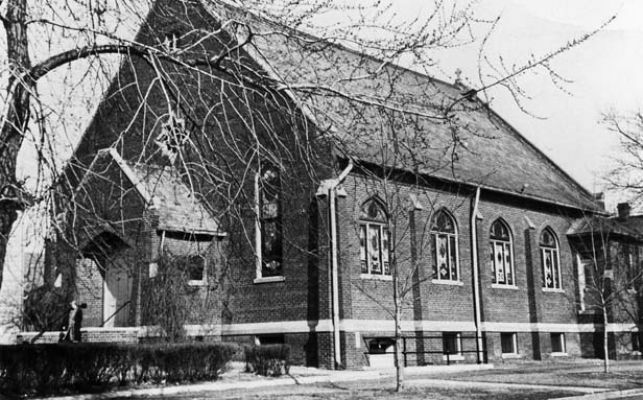 According to the Illinois State Journal & Register, St. Vincent de Paul’s was dedicated on May 14, 1911 following a parade and pageant grand marshaled by George Visnauskas (Wisnosky), and led by a “platoon of police,” followed by a marching band from Benld and a squad of Knights of Grand Duke Vytautas (of Lithuania) mounted on horseback (see photo below of the Knights in their uniformed splendor, keeping in mind they were probably all hard-scrabble coal miners). At least a thousand Catholic marchers joined in the procession, which began at St. Vincent’s and made its way to Sacred heart Church, then St. Peter & Paul, at each stop picking up marchers from various church societies before parading to St. Vincent de Paul’s for a dedication by Bishop Ryan of Alton and a solemn high mass celebrated by Rev. Dean Kranezunas of Chicago, assisted by Fr. Lawrence Ryan, “master of ceremonies,” as well as several other priests as deacons. Homilies were given by Frs. Skrypko Petraitis, Crosson Clancy, and Lougrey of Chicago, according to newspaper articles. 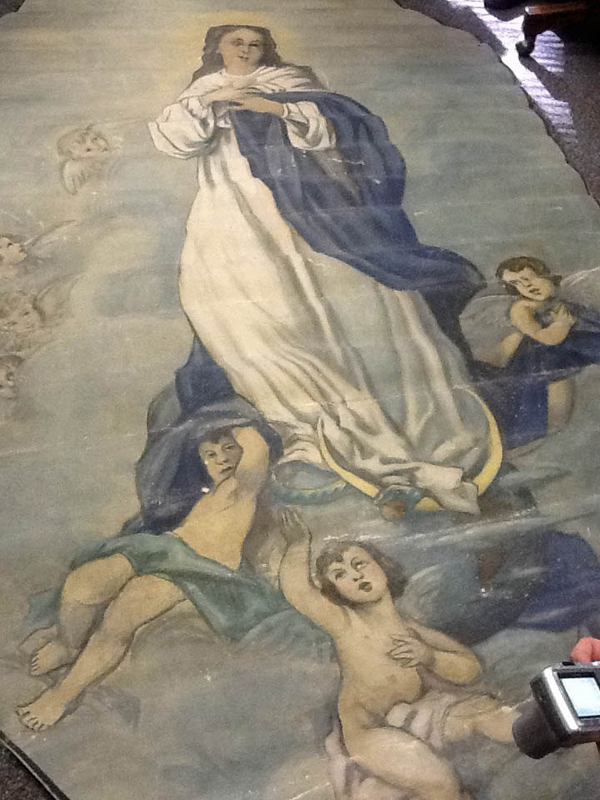 The Immaculate Conception ceiling mural, St. Vincent de Paul’s. From St. Vincent de Paul’s, the St. Vincent’s, St. Joseph’s, and National Slavonian Society No. 302 marched. From Sacred Heart: St. Barbara’s Croatian Society, St. Boniface Sr. No. 2, W.C.M. and the Sacred Heart Catholic Order of Foresters No. 264 marched. From SS. Peter and Paul’s: St. Aloysius Young Men’s Society, St. Vincent’s Society, St. Peter’s Court No. 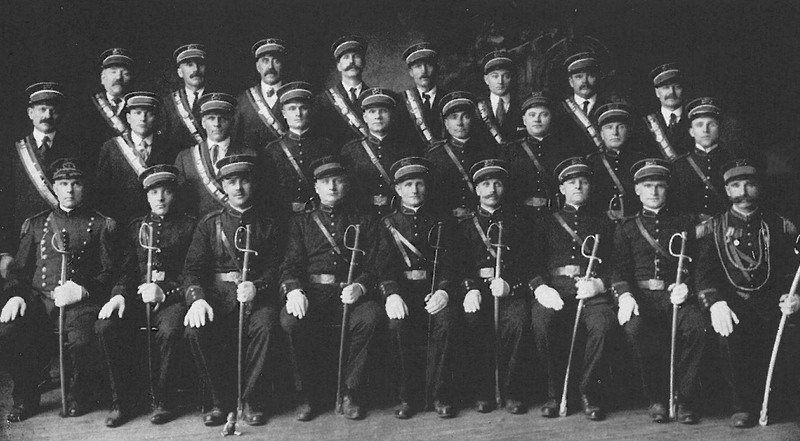 192, Catholic Order of Foresters, and St. Paul’s Branch No. 57, Western Catholic Union. A half a dozen languages were reportedly used in the dedication and high Mass. Fr. Czuberkis was the pastor of St. Vincent de Paul’s on that grand dedication day so long ago. 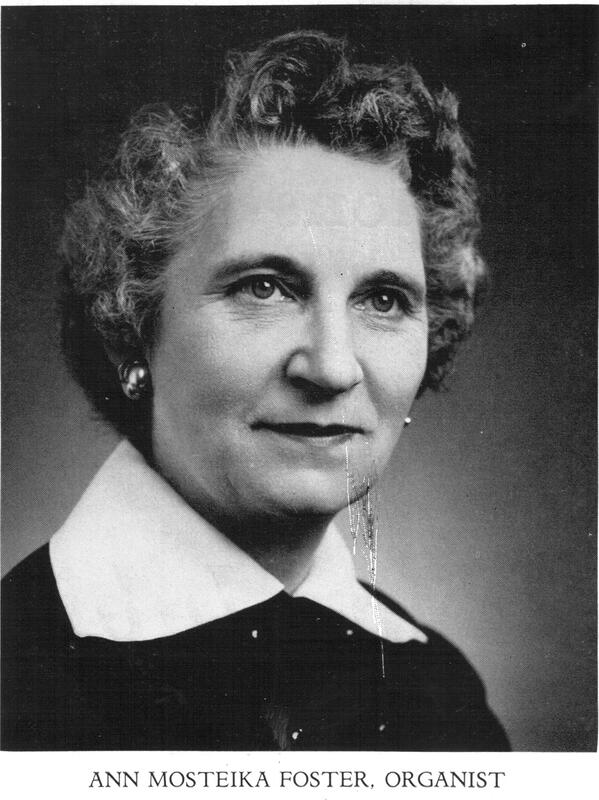 Ann (Mosteika) Foster, St. Vincent de Paul Church organist and music director, 1933-1972. St. Vincent de Paul Jubilee Book, 1956. 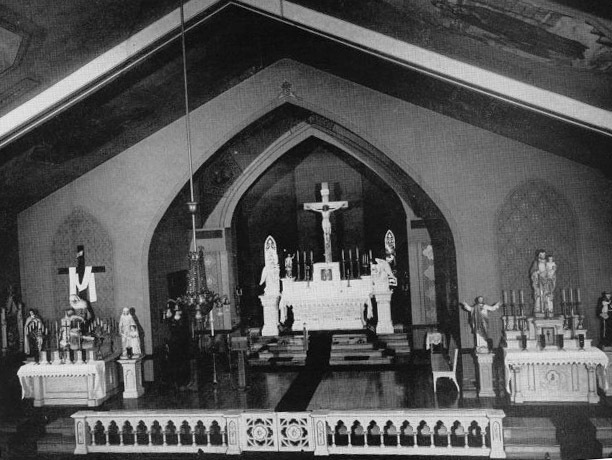 The church proceeded to serve as a culturally and socially rich center of life, populated with many clubs and societies, for Springfield’s original Lithuanian immigrants, their children and grandchildren. Many whose condition never allowed them to learn English well depended on the church community for all their spiritual and social needs. 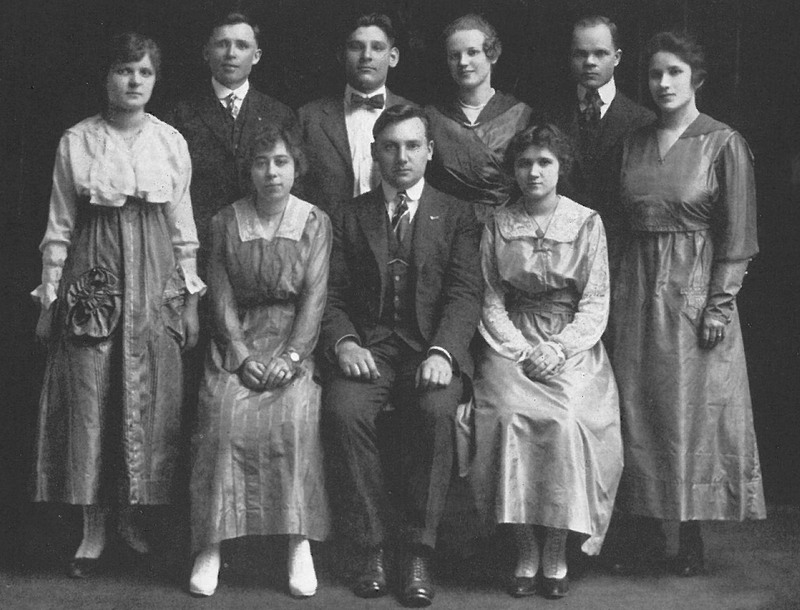 The church–and the spirit and effort its members poured into it–was also an elevating force that helped Springfield Lithuanians transcend the challenges of a harsh mining life, as well as many other economic and educational disadvantages. When St. Vincent’s pastor for 47 years, the Rev. 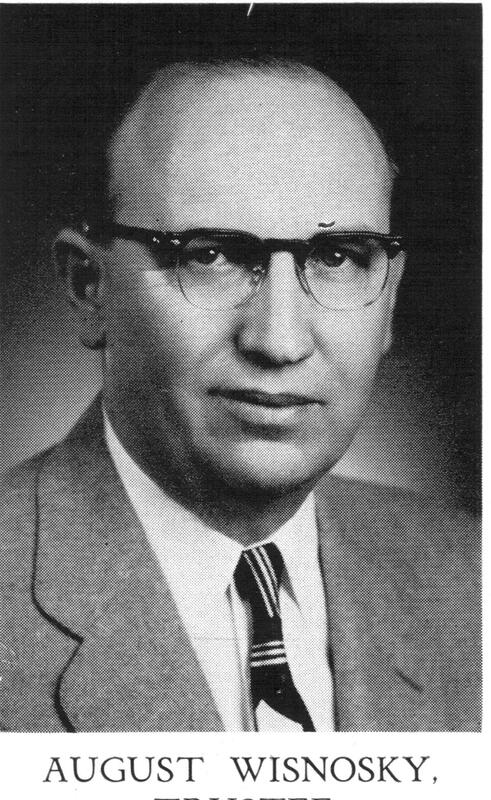 Stanley O. Yunker (Lith. Junkeris), suffered a stroke and retired and the diocese closed St. Vincent de Paul’s on Jan. 1, 1972, a significant number of elderly immigrants were hurt and alienated. A group of parishioners led by 22-year trustee August Wisnosky, Sr. had found another Lithuanian priest to lead the parish and even formed a group that fought to keep the church open, to no avail. Fr. Yunker established a college scholarship fund, now held in trust by the Foundation for the People of the Catholic Diocese of Springfield, for Lithuanian-American students with a family connection to the church. The parish’s 1956 Jubilee book (preserved in the Sangamon Valley Collection) gives special honors to Wisnosky, 25-year trustee Simon (Sam) Lapinsky, 20+ years trustee Anthony Yakst, and 38-year organist and music director Ann (Mosteika) Foster. In telling the rich history of the parish with photos, the Jubilee booklet also celebrates the ordination of three young men from the parish in a single day on April 19, 1936: the Reverends Casimir Andruskevitch, Peter Klumbys, and Casimir Toliusis. The Rev. 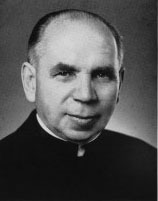 Charles E. Olshevsky was another Lithuanian-American priest native to Springfield. 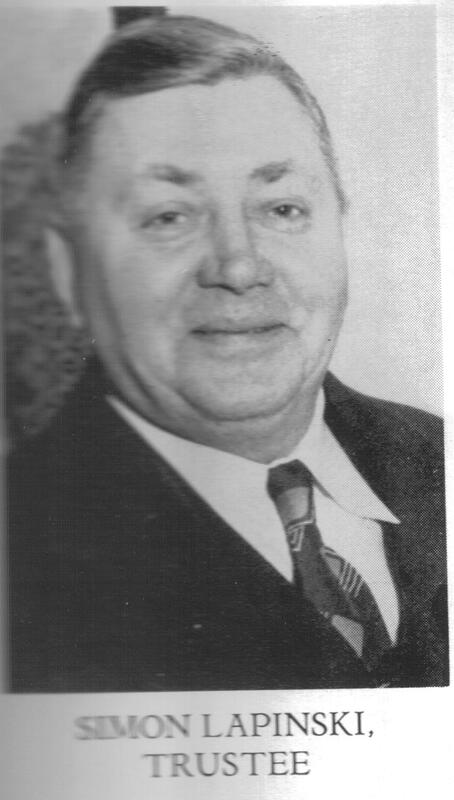 The son of Wallace and Julia Shupenas Olshevsky, Fr. Olshevsky was pastor at Little Flower parish 1960-64 and St. Cabrini 1986-92, among many other postings in the diocese. The Rev. John Rodutskey, brother of Sacred Heart Credit Union co-founder Walter Rodutskey, grew up in Springfield with Lithuanian immigrant parents, and seems to have served at St. Vincent de Paul Church for a time. At the time of his mother’s death, he was in the O.C.S.O. order in Gethsemane, Kentucky. Finally, the Rev. James T. Ulak, M.M., the son of Mrs. and Mrs. Ignatius Ulak of Springfield, was ordained to the missionary priesthood at the Maryknoll Seminar near Ossining, N.Y.
As a young wife and mother in the 60’s I attended St. Vincent Depaul. It was one that had A/C and I well remember how nice it felt, when some of the others did not have it. I cried when it closed. Many memories I have of it. I remember Fr. Yonkers. I have fireside irons that came from there. I know many of the older members were hurt when it closed. I was a member of that wonderful choir. 3 of us very young girls were invited to sing. and we did for years. My great grandma and grandpa Tweryon went to that church. Anne Foster, the organist and choir director was my aunt and godmother, My father and her husband were brothers. We visited St, Vincent de Pauls many times in my youth. My mother was a Rautis and her family lived at 1411 Reynolds st. She was in the choir in her youth.